Your wedding day is one of the most important days of your life so whether it’s a natural look or more of a glamourous one, our brides get what they ask for. Feel calm and relaxed on your big day knowing that you will get the flawless makeover that you are after and more importantly, you will get the longevity you need with both hair and makeup. With Pooja, you get the end to end service and it doesn’t stop at just getting you ready physically but also mentally, by helping you calm any nerves that may be present. What sets Pooja apart is her nature to listen and remain calm, and her method of adapting specific looks to each individual’s face. You deserve to look absolutely stunning, not just on your wedding day but also on your pre wedding ceremonies including Engagement, Sangeet and/or Mehndi night. Let Pooja create a tailored package with looks that will set each event apart from the other. You’ve had your big day, but that doesn’t mean you can’t look absolutely stunning on your post wedding day ceremonies such as the Reception. 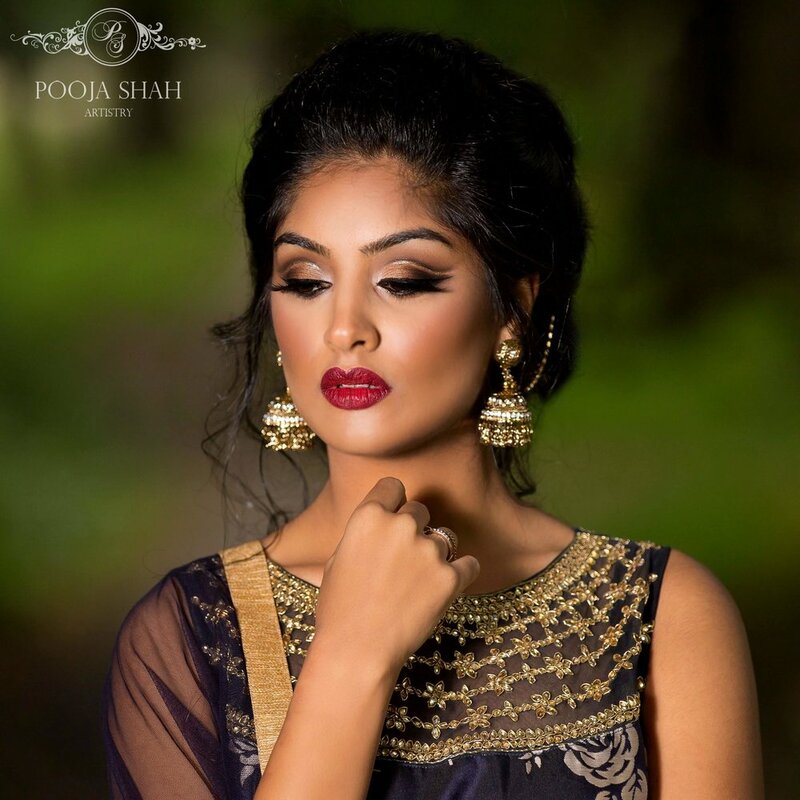 Feel relaxed in Pooja’s hands whilst she creates the perfect hair and makeup look for your special occasion. Pooja has been practicing henna since the age of 10 and has focused on Bridal Henna for the last 5 years. Being a self taught henna artist, Pooja was able to develop her own style swaying away from the traditional Indian/Asian style and offering something more contemporary and intricate. Quotes are provided based on the amount of coverage required. Whether it’s a party, birthday or any other special event, why not look absolutely fabulous with flawless hair and makeup tailored to suit your outfit and the style you’re after. The trial allows you to envision a specific look you have in mind or to step out of your comfort zone to try out something different. It’s all about exploring your imagination to fully understand your dreams for your big day. Therefore, it’s important to have a trial so that both the artist and the client are a lot more at ease on the day of the event and know exactly what needs to be done. Calling all models, photographers and other suppliers that wish to collaborate. Please get in touch to discuss projects.